Need some easy summer drinks for toddlers and kids? What are the healthiest drinks for kids to chill out in summer? Today’s post is about 16 yummy and easy to prepare summer drinks for your little one to keep them hydrated and active. Summer is here and looks like it’s going to be this way for a while. The sun seems to be in a good mood and is blazing away to glory leaving the poor earthlings to fry. The worse hit are our poor kids and the animals. Moms, do not forget to leave some water out for the birds. It is an act that won’t cost us anything but will do a lot for the environment. Our kids need hydration, now more than ever as the lack of it can cause a lot of issues. We can’t do much to turn down the heat of the sun, but we can help to keep our kids hydrated. Kid’s may not favor the idea of drinking water. I know this for a fact because I used to be called Kangaroo rat by my mom, no prizes for guessing why. Fortunately my little one has taken after her dad and keeps drinking water (only water, and no food at times, much to my chagrin). But I know I shouldn’t complain as a lot of moms struggle to make their kids drink fluids. So I thought I will help you out, with this post. How much water does your little one need? A baby younger than 6 months gets all the water his/her body requires from the breast milk or formula. Once your child grows, he needs more. The easiest way to find out if your child has enough water is by looking at the color of the urine. If it is clear then all is well. But if it dark, then you need to increase the intake of water. Is your baby’s daily water intake enough? Why should you give your little one’s juices in summer? You would have heard that eating whole fruits are way better than drinking juices. Then is juice good for toddlers? Come summer, my appetite levels dip and I find it difficult to eat food. But I know I have to eat whereas my little one doesn’t understand that concept. She gives up on food! She doesn’t understand the fact that she needs to eat her to keep the strength up! Juices are a great way to ensure that your child’s energy and nutrition needs are met as they might be eating less. But remember not too much! 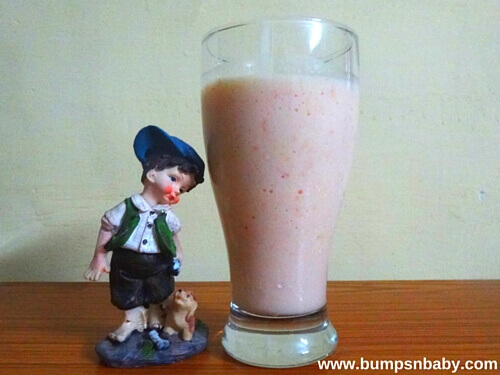 You can also read about the juices for infants/baby when, why and how. As you now know, water is not the only way you can keep your little munchkin hydrated. You can always sneak the fluids in through some delicious juices. I am not talking about the sugar rich packaged juices. These 9 drinks are power packed with nutrients and way better than those store bought packaged juices. I love the homemade juices, because I know what is going in it. So here you go, my little one’s favorite summer drinks. This yummy drink is made with curd which is excellent for digestion, cardio-vascular health, skeletal system, skin and overall immunity. It is a rich source of calcium, vitamin D and protein. Apart from that it is also good to cool your body. Blend the ingredients together using a blender/ butter churner. Peel the outer layer of the sugar cane. Cut it into small pieces and put in the blender with water and ginger. Blend and extract the juice. Add sugar if required and a dash of lemon juice. You know how good curd is. This version of lassi has sweet lime in it. Sweet lime contains Vitamin C and it is good for digestion, ulcers, respiratory problems, immune system and is known for its anti-cancerous properties. It is also good to keep urinary infections away. It is especially good for the summers as it helps to treat dehydration and heatstroke! Extract the juice of the sweet lime and leave it in the fridge to cool. I do this to avoid splitting of the curd. The hot weather and acidic nature of the sweet lime can cause things to go sideways. After it is cool, blend all the ingredients together using a blender. This is an easy way to heaven and your little one is sure to love it. But ensure that it is consumed immediately, as I mentioned before, the heat can cause it to go bad. Oh what I would not do for a glass of yummy solkadi! Good as an appetizer/after meal drink, solkadi is also made with kokum/sol. There are two varieties that you can make. One with coconut milk and the other without. My favourite happens to be the one with coconut. While making solkadi for kids, you can omit chillies so they will relish it. You must have heard of using lemon water the first thing in the morning. But they have other uses too. You know lemons are rich sources of vitamin C. It helps to strengthen the immunity, help you deal with allergies, reduce chances of stroke and cancer and increasing iron absorption. It also helps to maintain a healthy complexion. Apart from adding freshness, mint is good for the digestive system. It helps to fight cold, cough, allergies etc. Muddle the mint leaves in the jar you plan to mix the lemonade. Add the lemon and water. Mix well. Add honey or sugar for taste. You may also add a dash of black salt if your little one likes it. 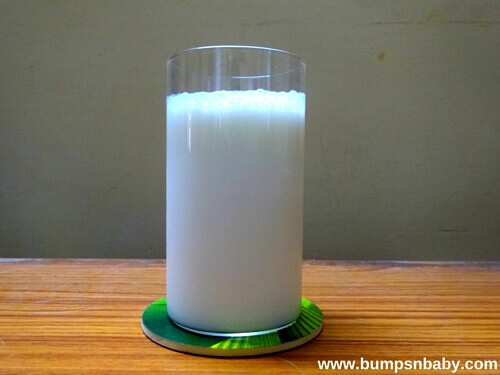 Buttermilk is yummy and a great summer drink for your little one. Know what the best part is, you can have many varieties of this humble drink. Don’t believe me? Read all about variety buttermilk recipes for toddlers and kids. This berry packs a punch. It fights inflammation, lower blood pressure, heart diseases, joint pain, arthritis etc. It is used to combat fungal and bacterial infections. There are talks that it is good against cancer, but it hasn’t been proven yet. 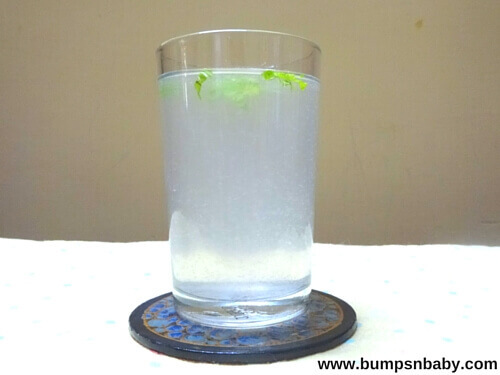 The addition of mint makes it a refreshing summer drink. Remove the pomegranate arils from the pomegranate. Pomegranate arils are just the seed pod that you see once you cut open the fruit. Put 2 cups of that to the blender. Add the mint leaves too. Blend and extract the juice. To remove the seeds and pulp from the juice you can use a strainer. Use the water and mix the extract and pass it through the strainer again. Add honey or sugar for taste and mix well. This drink is made and offered to the lord during Ram Navami. But it is loaded with benefits and makes a yummy summer drink as well. You know the benefits of lemon. 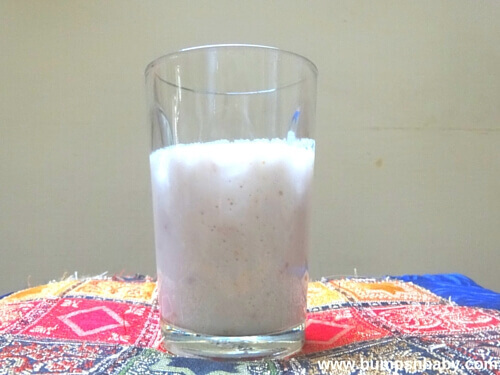 In this drink lemon is joined by jaggery, cardamom powder, dry ginger powder with water. Jaggery is said to be better than sugar due to its many benefits. It is good to fight the flu and boosts the immunity. It is good for the liver and purifies the blood. It helps to treat anemia, blood pressure, joint paint, respiratory problems etc. It is also good to regulate the body temperature. Cardamom and dry ginger powder are spices that bring in their own benefits to this yummy drink. You can add one of two leaves of tulsi to this too. Mix the jaggery in water. Filter it to remove impurities. Now add the rest of the ingredients. Mix well and serve. 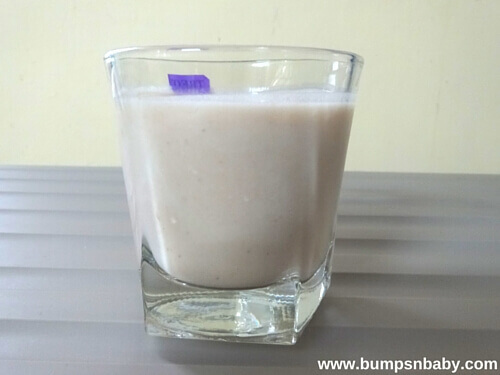 Bananas are rich in calories, so if you worry that your little one is not gaining weight then this shake is a great choice. Bananas coupled with yet another calorie dense ingredient in this shake makes it awesome. That is right, sapodillas or chikoos are a tasty option to gain some healthy weight. The best thing about this drink is that kids love the sweet taste and because of that it doesn’t require any sweeteners either. Blend all the ingredients together. You can avoid adding any sugar or honey as the fruits are naturally sweet. You can increase the quantity of milk to achieve the desired consistency. This kept me going through the hot summers when I was pregnant. This contains dietary fibre, vitamins and minerals. It also contains electrolytes too making it a wonderful energy drink for summer. 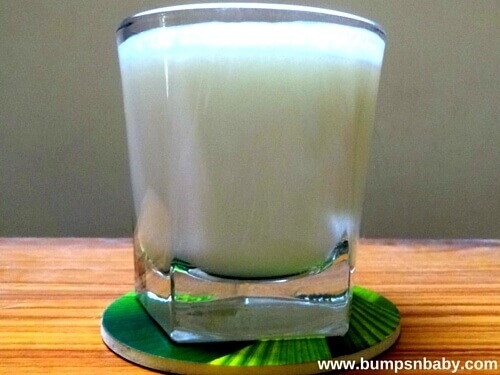 Offering your child some yummy coconut juice will make him/her feel energized during the harsh summer months. Papaya in a shake might sound a bit unappealing to kids. But the ripe fruit tastes yummy and with dates for company this makes a delicious drink. Papayas contain anti-oxidants, vitamins and minerals. This fruit is good for the digestive tract, immunity, arthritis, heart diseases etc. You know how drained you feel in summer. Dates will help to keep the energy levels high. Apart from that it is good against constipation, cholesterol etc. Dates are good as it contains many vital vitamins and minerals. It is also good for patients suffering from anemia. Soak the dates in some milk or water for an hour or two. Remove the seeds. Put the dates, papaya and milk in the blender. Adjust the consistency by adding milk as required. 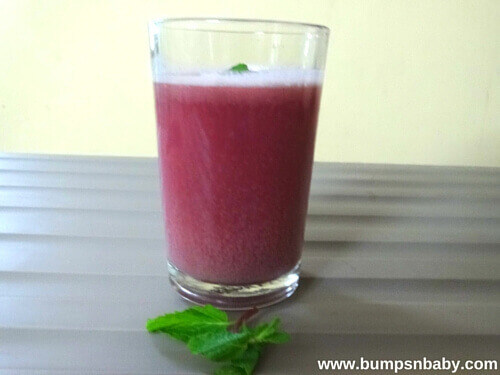 Rose sharbat is another summer cooler that kids will love. It will help to keep your little one cool. Rose is usually not the first thought that comes to your mind when you think of health. But then this drink will change your opinion about roses. Did you know that coconut milk and sapodilla makes a great duo? I didn’t know till I tried this yummy drink. Coconut milk is also rich in many nutrients and helps in keeping your skin and hair healthy. Apart from that coconut milk helps to make everything tasty! Soak the dates in some milk or water for an hour or two. Remove the seeds. Put the dates, papaya and milk in the blender. Adjust the consistency by adding milk as required. The sapodilla helps in making this sweet so you don’t have to add any sugar. But if you feel that it needs more, then use some honey or sugar. Transform your normal watermelon juice by adding some cucumber juice too! You know that watermelons are mostly water. It also contains anti-oxidants, vitamins and is excellent to hydrate the body. Probably why watermelon is associated with summer. Now let us look at how the cucumber helps us. Ever heard of the saying ‘cool as a cucumber’? Well, that was the primary reason I chose this for this recipe. Apart from keeping you cool, it also contains dietary fibre, sodium, vitamins A and K.
Peel the cucumber and cut it lengthwise. Remove all the seeds. Now chop it into smaller pieces. Use the blender to juice the cucumber, sieve it. Extract the juice of the oranges. Mix it with the cucumber juice. Add water and sugar/honey according to your preference. This tastes best when it is chilled. Don’t let the name throw you off guard. Sarsaparilla is our very own nannari/ naruneendi. It is known to cool the body down and hence is excellent for summer. You get nannari syrup from shops but you can easily make it at home. You can get sarsaparilla roots from shops that sell Ayurvedic medicines/herbs. Wash and dry the roots. Crush it and get rid of the white core. Boil the water till it bubbles. Turn off the gas and add the root. Cover and keep overnight. Strain the mixture well. Next add the sugar and boil the mixture. Once the mixture resembles honey, switch off the stove. Once it cools down completely, add the lemon juice. To make the sharbath take 2 or 3 spoons of this syrup, add water, sugar. You can also add some lemon juice. Kokum (Garcinia indica) is used in dishes in the Goa and Maharashtra belt. It helps to cure digestive ailments and keeps flatulence away. It is also an effective anti-histamine. I know this as I broke out in hives once after having a dish. I was petrified, but fortunately a friend’s mother asked me to apply Kokum, and it vanished!! 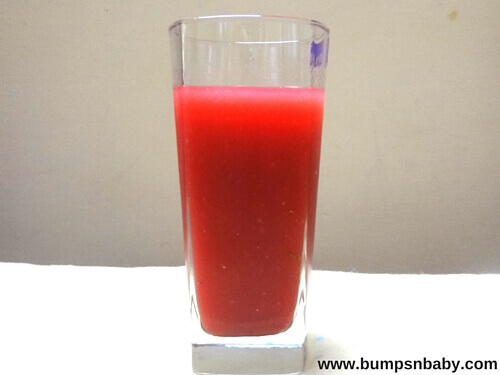 Kokum sharbat will help to cool you down during the worst of summers and will help in keeping you refreshed. Kids will definitely love the taste! You can also read about the health benefits of coconut water for babies and kids. Always consume juices immediately after they are prepared. Or else they will oxidize and won’t be as good. If there is any leftover juice, don’t leave it outside as it can get spoiled in the heat. While juices are a good way to sneak some nutrients into your little one’s body, too much will cause your child to reject other food. It is true that they need a lot of fluids, but not so much that they give up eating anything solid. Too much juices may also cause loosies in your little one. Avoid letting your child walk around with sipper/bottles with juice. The sugar (even the naturally sweet juices) will cause their teeth to rot. Make sure the fruits are washed thoroughly before you juice it. 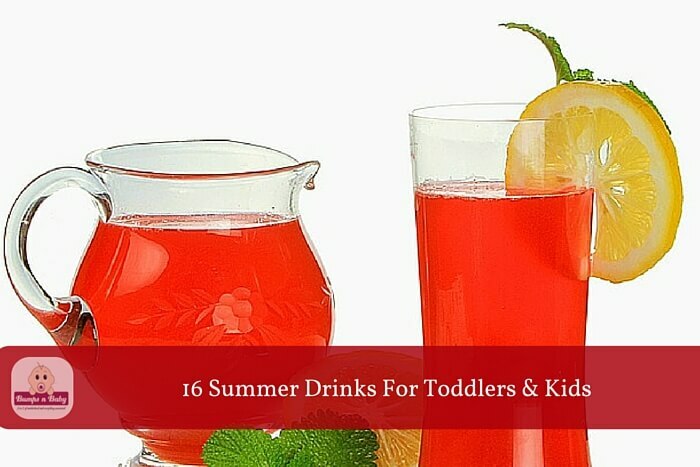 So there you have it 15 healthy summer drinks for toddlers and kids! They will help them beat the heat while keeping them hydrated and nourished. Let me know how your little one liked it. Waiting to hear how it went! Also tell us your little munchkin’s favorite summer drink. Bye and don’t forget to stay cool!! The following post was really helpful. I’ll do the same for my 3 year old daughter. But, I have a query. What if the child has a heat body? What all could be given to him/her. Please do write a blog on this too.